After they released Moskov, Mobile Legends are now back in the game with the latest hero named Autobot Johnson. On the highlight released, this new hero looks like he’s a tank by its appearance and, being a robot he should have a longer durability. One of his skills is he can transform to a monster truck and can carry teammate along the way to quickly run to the closest target or escape away from the clash. 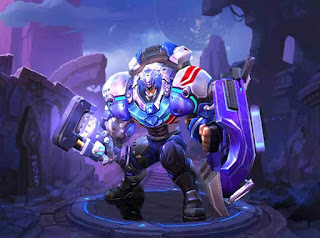 Autobot Johnson, can also shoot missiles to his targets along with the other abilities like electric shield and pipe wrench hammer. He’s passive seem to be a shield that can absorb damage and increases health ones hit by the enemies. The first skill is the electric loaded pipe wrench, hammer that smashes the closest target. The shooting missiles it his second skill, blows out the enemies within the range. Last is the super cool ultimate transformation into a monster truck or car that travel so fast to anywhere you go and stun enemies. This skill is like Yi Sun-shin, where he can navigate to target riding his navy ship. By watching the video you can already know how powerful Autobot Johnson is. For now we don’t have the other details like the release date or availability on store, but don’t worry we will keep you posted about this latest hero as soon as Mobile Legends announce more details.